Arrange the onions in the bottom of the slow cooker. Add the garlic cloves and top with the beef roast. Pour the beef stock and the white wine directly over the beef. Season with salt and pepper. Cover the slow cooker and cook on low for 7-8 hours, until the meat is tender. Remove the beef from the slow cooker and allow to rest for 10 minutes. Meanwhile, turn the slow cooker temperature to high, cover and let cook while the beef rests. Slice the beef against the grain and serve with au jus and onions from the slow cooker. Five ingredients. Four steps. And a slow cooker. How easy is that? When I stumble in the door on Tuesdays after running from school to activities to meetings, I don’t want to cook. Or think. Or do much more than throw some food on the table – delicious food. 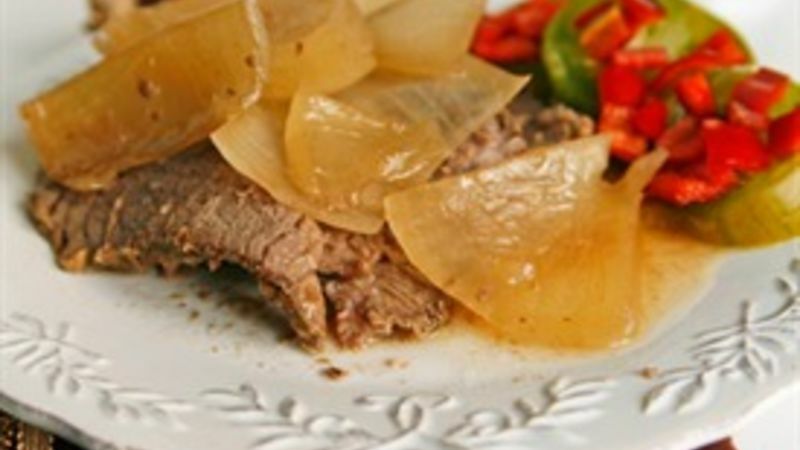 Enter Slow-Cooker French Onion Pot Roast. It’s my answer to that "Why-can’t-dinner-just-be-ready?" question. The dish gets props from my whole family (that’s a huge plus), and I love that it combines one of my very favorite soups (French onion) with one of my husband’s favorite dinners (pot roast). And since the onion pieces are big, my onion-hating husband doesn’t even complain about them since he isn't blindsided by them. It starts with five fast and easy ingredients, plus salt and pepper. Prep time? Five minutes. You cut onions into eighths. Crush some garlic. Toss it in a slow cooker, top with a beef roast. Then pour in beef stock and white wine. Season with salt and pepper. It’s too relaxed to be hard. It’s too fast to be an ordeal. Just bang out the steps, turn on the slow cooker and go. And when you return home? Dinner will be waiting. Love that. For hump day, or any day, it's your slow cooker to the rescue! Treat your new BFF appliance to a bit o' variety with these easy dinner recipe ideas.